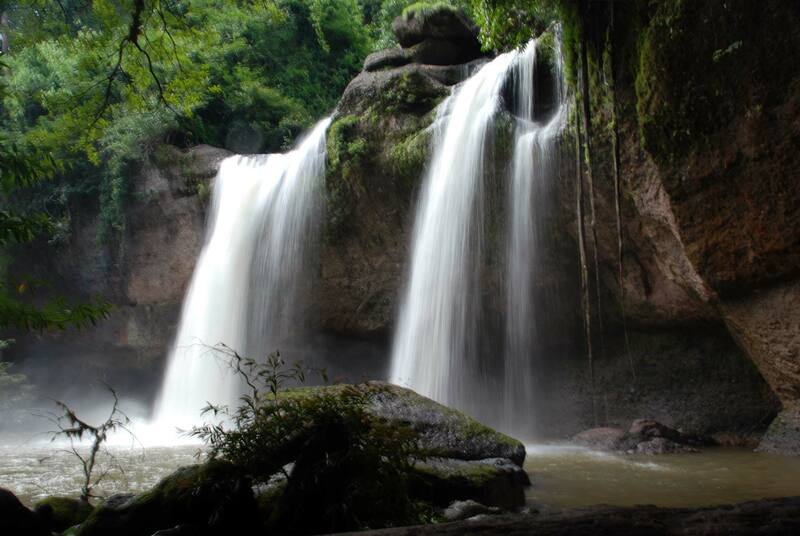 A favorite of Bangkok residents, Khao Yai National Park is one of Thailand’s most beautiful national parks. Not only does it have thick, luscious rainforest, cascading waterfalls (remember the waterfall from the movie The Beach?) and abundant wildlife, but it’s often several degrees cooler than Bangkok, offering a welcome respite from the heat for those whose faces are melting off. I visited Khao Yai in early October. The area surrounding the National Park is full of boutique hotels and resorts nestled into the forest and mountains surrounding the park. For the gay nature lover, this is your luxury playground. I chose Bonanza, a sprawling property that includes a golf course, zoo, rock climbing walls, horse riding trails and more. It even has a car racing track and go kart/quad bike racing for the rev heads out there (I couldn’t resist). Although it sounds gimmicky, I really enjoyed the gardens and facilities. Perfect if you like to be kept busy or are planning to bring the entire family along on vacation. Despite the name, you won’t find many cowboys at the resort – you’ll need to fulfill this role. My main goal was hiking and wildlife spotting in the national park so headed out early the next morning. I was dropped at the park entrance by the local bus, paid the entrance fee of 500 baht ($17) and decided to hike the 13km to the park headquarters. Surrounded by forest and mountain views (plus very little car traffic), the hike turned out to be very pleasant. Once I arrived at Park HQ, I grabbed a bite to eat at the restaurants close by. They serve basic Thai food, cheap and tasty. I’d have killed for a beer at this point. Unfortunately no alcohol is sold within the park (bring your own champagne!). After lunch I checked into the bungalow I’d previously booked online from the National Parks Office . I’ve stayed at bungalows in Thai national parks and they range from ‘cute but basic’ to ‘basic’. In this case it fell on the ‘basic’ end of the spectrum. The various deer and monkeys I nervously passed on the way to the bungalow added a certain Tarzan charm. The charm evaporated by nightfall when a termite colony covered one bedroom wall. I REALLY needed a beer by this point. At least the temperature was a lovely cool 20 degrees (glass half full!). I eventually made my way back to the road and instead hiked and hitchhiked to the more sensible attractions – beautiful waterfalls and wildlife observation towers. There’s no way I was going to stay another night in the park so I headed out after lunch. They say hindsight is 20-20. Whilst I’d definitely go back to Khao Yai, next time I’ll be staying in a lovely boutique hotel outside the park rather than the ‘rustic’ cabins inside. For lovers of nature I’d recommend hiking and waterfalls within the park but make sure you have a guide and/or your own transport. And whatever you do, don’t go hiking by yourself in rainy season! Khai Yai is easy to get to from Bangkok. The best time to visit is during dry season from October til March. Besides the park there are numerous other things to do in the area – elephant conservation projects , Jim Thompson’s farm , mountain biking, white water rafting and even a winery. Enjoy! Newer Post Spoilt for choice in Phuket	Older Post What you got cooking?